Time to start this again. We are now accepting nominations for the February 2017 photo of the month. *This month we are seeking photos of buses that feature something which is non-standard - more details below. 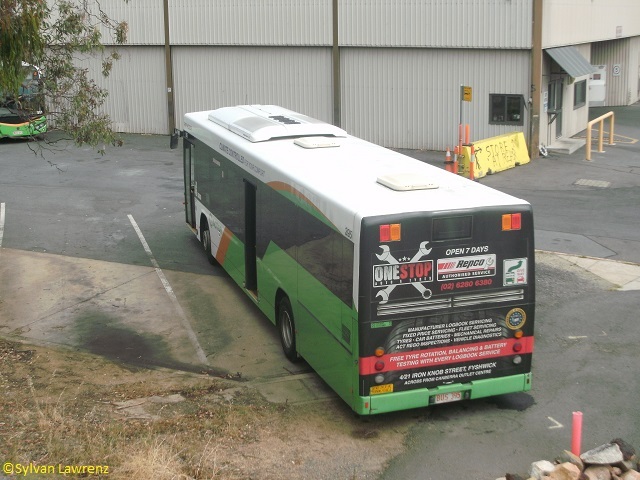 By submitting a photo which matches this criterion, you may post up to three photos - but all three must not be of the same bus. Submissions close midnight 28 January, Australian Eastern Daylight savings time, unless there are insufficient photos for a vote to take place, in which case nominations will be extended. More details about the bonus category: the photo must feature a bus with something that is non-standard for that bus model, and the non-standard feature must be visible in the photo and mentioned in the caption; however, the photo does not need to be a close-up of that feature. Examples of non-standard features are: missing or odd fleet numbers, stickers or logos, mis-matched body panels, trial or evaluation parts (such as Saydair seats in 940 or the Hanover desto on 307). What is not considered as non-standard: bike rack differences (DL2 vs VeloPorter2), flip-dot vs LED destos (other than 307), anything related to advertising (such as missing ad panels), missing badges from the front or rear of the bus (but rearranged badges are acceptable), unrepaired accident damage such as dents or broken panels. Bus 301 at Spence Terminus. Following repairs to the nearside body, a non-standard ACTION logo was used. Haven't been around on here for a while, but I got some shots recently that aren't great but will do for an entry. I don't know if I'm breaching rules posting this in an album like this so please tell me if I have. 534 dead runs along Athllon Dr with 973 in close pursuit. 547 turning from Alinga St into Marcus Clarke St on a northbound route 900. And my "non standard" photo is this one of 898 travelling through the City Bus Station with the accreditation panel that likely came from a Mark I Renault PR100.2. Why indicate with 2 lights when you can flash 'em all? The fine line- the old and the new. Is that 344 I see? Yes! YEEEEEESSSSSS I am 344! Do you get it already? I AM 344! Thought I was too late for an entry, but apparently not. 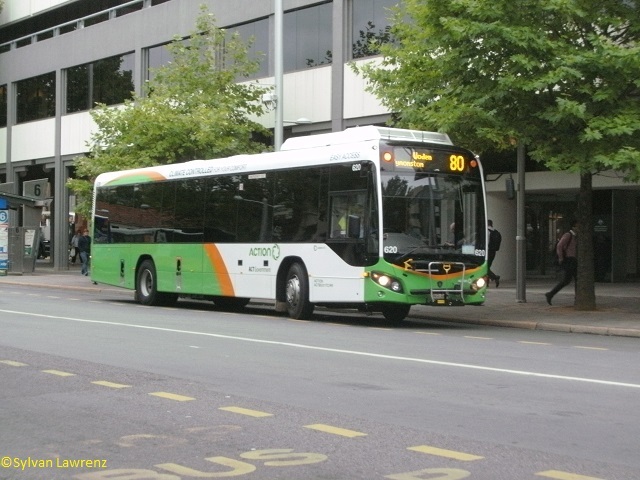 This one was taken the first day I saw 622, back when I was up at Belconnen last. and don't worry, I took this shot from the above car park at office works through the fence, I wasn't on the Depot grounds. I took this today, but I was originally using it as my perspective shot for my drawing, turned out to look quite good, imo. 611, 374 and 387 at Wodens set-down. For my 'non-standard' entry, I chose 374, as its number sits above the black door panel, instead of on it. (if this is not good enough for the bonus category, you can delete it). Given the large number of submissions, I have decided to close nominations early and open the voting. You can vote for up to 8 photos. Voting closes in less than 24 hours. Right now we have a tie - so if you haven't voted, please do so. In another close vote "534 & 973" was the winning photograph. 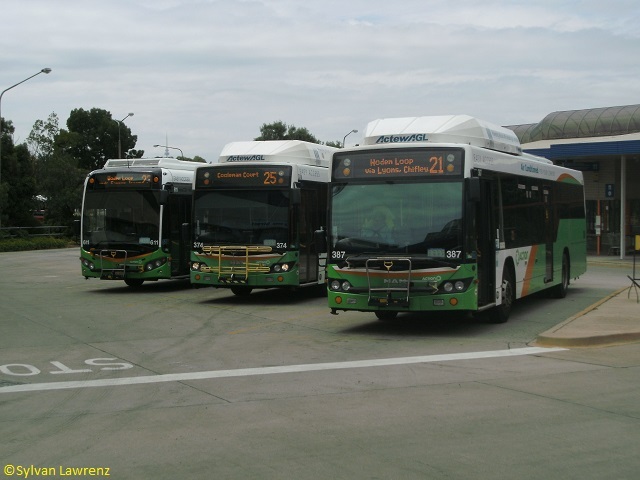 Non-standard buses may return later in the year, but next round's bonus category will be Buses 894-940. Gotta say, it was a great bunch of photos this month. Well done all.